Sidi Baba and her friends sink into the cave of thieves, in the light of their oil lamps. But what is the right direction to take the fabulous Thieves' Treasure? Time is running out, because the Chief Thief has gone after them! 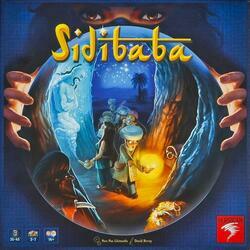 Sidi Baba and his companions must enter the labyrinth. All decisions are made jointly and the time to make them can be very expensive. But as far as the sharing of jewels is concerned, it is everyone for himself and only the richest will be declared the winner. For his part, the Chief Thief will do everything to delay Sidi Baba and his companions so that they remain prisoners of darkness forever! Contents of the box : 1 screen allowing the Chief Thief to hide the labyrinth, 10 3D views representing what adventurers see in the labyrinth, 2 front and back trays (4 different labyrinths), 1 corridor, 1 orientation tile, 6 adventurers, 62 Jewel and Genius tokens, 5 Curse tokens, 20 Event tokens, 12 Oil Lamp tokens, 1 Thief Chief token, 1 Treasure token, 5 Safe tokens, 1 red triangle, 1 hourglass of 3 minutes, 1 bag, 1 die, 1 game rule.